General Hospital (GH) spoilers straight from actress Kathleen Gati, who plays the wicked Dr. Liesl Obrecht, reveal that the wedding is still on between Kelly Thiebaud (ex-Britt Westbourne) and Bryan Craig (ex-Morgan Corinthos). Gati was live tweeting with fans today for #AskGH when she dropped the matrimonial bombshell. It seems that there is no split (or Bryan and Kelly made up) and the March wedding may still be on! Rumors have been swirling since year’s end that Kelly and Bryan had called it quits because the couple that regularly shared social media love gushes about one another hit an online wall of silence on their relationship. The former GH co-stars suddenly stopped appearing in each other’s social media timelines and then holiday pics showed her in New York City and Bryan chilling with pals in warmer climes. Kelly posted Instagram photos of herself in the Big Apple without her wedding ring and making comments about her “new life” across the country. 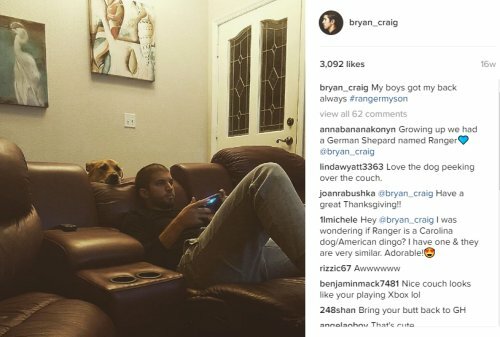 Kelly also promoted her work with an improv troupe and even captioned photos of her beloved pooch Whiskey calling him her “boyfriend” rather than Bryan Craig. For his part, the actor posted photos of himself out with his bro squad and home alone playing video games. But then, out of the blue, Kelly ran out of New York and back to LA sharing pics of herself in Malibu and Santa Monica and saying how glad she was to be back on the West Coast. Given the media silence on each other and Kelly shedding her ring, it now appears that the General Hospital duo may have split and only recently reconciled. This means their wedding may be back on track and coming soon based on Gati’s tweet today. Surely Kathleen Gati would have said “no comment” or ignored the question if Kelly and Bryan were split up and not getting married. It seems very likely that Kelly’s on screen GH mama would know whether or net Kelly and Bryan were getting hitched since the cast of the ABC soap is known to be a tight knit group. Plus, Kelly and Kathleen always had a warm rapport and got to know each other well playing mother and daughter on General Hospital. 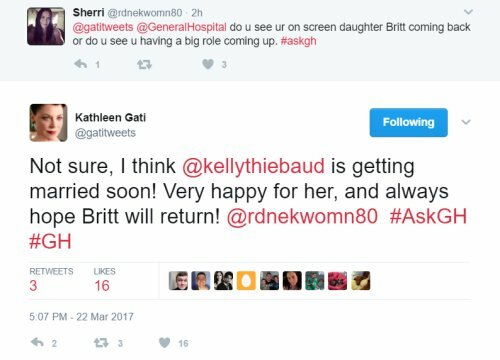 If Kathleen Gati says Kelly Thiebaud is getting married, that’s a pretty solid confirmation. Perhaps Kelly and Bryan have gone quiet on social media because they were taking time apart to reconsider things and didn’t want to announce a break up or a make up. Let’s hope we have official word soon that Kelly Thiebaud and Bryan Craig said their I do’s and they’re back together for good. Share your comments below on Kathleen Gati’s wedding tweet about Bryan and Kelly and tune into CDL often for the latest General Hospital spoilers, news and updates. General Hospital Spoilers: Liv’s Revenge on Duke’s True Love, Poisons Anna – Can Griffin Save Her?